One of the first reds from the great 2016 Bordeaux Vintage! This beautiful Bordeaux wine reigns from the heart of the Entre-Deux-Mers region in Bordeaux at the beautiful winery of Chateau Allégret, situated on clay slopes and limestone. 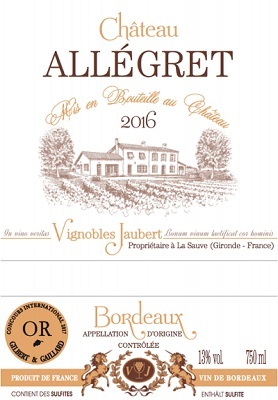 Chateau Allégret presents a traditional expression of a classic Bordeaux wine. The blend of Cabernet Sauvignon and Merlot gives the wine bright and rich red fruits, such as black currants and fresh berries. Layered with the dry tannins and concentrated texture, while balanced with its acidity and minerality, this wine drinks beautifully from start to the structured finish. Girard wines at great prices! Old Madeira!! A good thing!